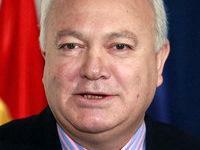 Miguel Angel Moratinos, Foreign Minister of Spain, presiding in the EU, spoke in an exclusive interview with Trend News European Desk. Q.: How do you estimate 2009 in terms of political, economic and cultural relations between Spain and Azerbaijan? There are reports about opening of the Spanish embassy in Azerbaijan. What is the progress with this initiative? What spheres of bilateral cooperation do you regard as the most prospective ones? A.: Spain's Presidency at the OSCE was a turning point in the relationship between Spain and Azerbaijan. Since then and during 2009, the political, economic and cultural contacts between the two countries have increased, although they can certainly be deepened. From an economic perspective, we will have to solve a big contradiction: our economies supplement each other but our bilateral trade figures are low. Spanish exports can be increased and Azerbaijani imports have a potential to be diversified. Direct investments can also be promoted since Azerbaijan has a growing economy and some of our companies are world leaders in sectors like telecommunications, energy and infrastructures. Second, ties between our people constitute a fundamental pillar of our future relationship. The Spanish readership at the Azerbaijan University of Languages is a good start that needs to be consolidated and more initiatives like this must follow. As for political ties, regular political dialogue and a sign of the maturity of a relationship are important. Therefore, Spain welcomed the opening of the Azerbaijani Embassy in Madrid and looks forward to open the Spanish Embassy in Baku. Spain's EU Presidency will constitute a new opportunity for Spain and Azerbaijan to get to know each other better, to deepen political links between both governments and to build a solid foundation for economic and cultural cooperation. Q.: Spain has just assumed its fourth Presidency in the European Union and the first one after the Lisbon Treaty has come into force. How optimistic do you feel about this term? Don't you think that the rotating Presidency will lose its authority with the Lisbon Treaty? A.: Our country is proud of taking up the EU Presidency at this particular time, when we face challenges such as the economic and financial crisis and the revamping of the European Union itself, the implementation of the Lisbon Treaty, but also a renewed European Parliament, a new European Commission, and a new institutional framework, that includes a President of the European Council and a High Representative for Foreign Affairs and Security Policy. Spain views these challenges as an opportunity to contribute to substantial progress to turn the EU into a global actor, capable of speaking with one single voice. Thus, the Spanish Presidency is more than willing to cooperate closely both with Herman Van Rompuy (the EU President) and Catherine Ashton (High Representative of the Union for Foreign Affairs and Security Policy) to promote the role of Europe in the world stage. Q.: What will be the priorities of the EU foreign policy after the enactment of the Lisbon Treaty? Do you believe the establishment of the position of EU Foreign Minister could increase the EU role in resolving conflicts, including the territorial conflict between Armenia and Azerbaijan over Nagorno-Karabakh? A.: The Treaty of Lisbon provides the European Union with new instruments which will allow us to become a more capable, more coherent and more strategic global actor. This objective has been already reflected in the European Union Security Strategy adopted by the European Council in December 2003. The appointments of Herman van Rompuy as President of the European Council and Catherine Ashton as High Representative of the European Union for Foreign Affairs and Security Policy as well as Vice-president of the Commission constitute the most visible of the provisions contained in the Treaty of Lisbon in the area of foreign affairs. Spain is engaged to promote the European Union as a global actor and to support and protect human rights and the eradication of poverty in the word. This constitutes one of our main priorities for the next six months. We are working closely with the President of the European Council and with the High Representative/Vice President of the Commission to achieve this. After the entry into force of the Lisbon Treaty the commitment of the European Union to the multilateral system of global governance through the United Nations and other bodies remains. We will continue to speak with conviction and clarity on the major challenges that we face, including regional conflicts, and to act with all the instruments at our disposal in a fully-fledged and coordinated way. Q.: Turkish accession to the EU has become one of the hottest issues in the EU foreign policy. What is your attitude to Turkish accession process? What are Turkey's perspectives amid strong resistance of France, Germany and Austria in this regard? How do you estimate the recent democratic reforms in Turkey? A.: Spain firmly supports Turkey's bid for EU membership. However, at the moment, the main obstacle in the negotiating process is Turkeys' ratification and implementation of the additional protocol that extends the customs union to the newer members of the EU. The reluctance that some Member States show towards Turkey's membership is probably related to a feeling that Ankara is not applying the required internal reforms at the proper speed, but it seems that the Turkish government has reactivated these reforms. On top of the so-called democratic/Kurdish initiative that introduces democratic reforms, other steps have been taken in the second half of 2009. A National Programme of the adoption of the acquis communautaire (the EU legal system) has been passed. Minister Egemen Bagis has been appointed as head negotiator with the EU. The number of high-level visits to Brussels has increased. The intergovernmental agreement on the Nabucco gas pipeline has been signed. The negotiations for membership to the Energy Community have been opened. The resumption of negotiations with the EU for an agreement on readmission of illegal immigrants has been announced. All these are steps towards a process of general reform and democratization in Turkey that should help to pave the way for further accession negotiations. Q.: Will there be any changes in the EU energy policy during Spain's Presidency? What changes can be expected in diversification of energy routes and energy supplies? A.: During Spain's EU Presidency, we expect to adopt a new EU energy strategy for the next five years - the so-called 2010-2014 Energy Action Plan. It will be built upon energy security and solidarity as main basements. The objective will be to limit the vulnerability of EU Member States through different actions, such as: developing the internal energy market with more and better networks and interconnections; improving market access and transparency; strengthening energy efficiency by means of a revised and more ambitious plan; fostering energy diversification by sources, mainly through increased efforts to develop strategic energy technologies, together with the promotion of industrial initiatives on solar energy, smart grids, market introduction of electrical vehicles and carbon capture and storage technologies; and fostering external energy relations and cooperation with consumer, producer and transit third countries. Although energy diversification by sources of energy and supplying countries will continue being the highest priority, Spain's Presidency will also support plans already agreed by the EU to diversify transport routes for energy supplies towards EU Member States. Whilst we will continue giving a strong support to the development of the Southern Corridor Plan - and particularly the Nabucco Project, we will push the Mediterranean Ring Plan for gas and electricity as another strategic and priority action for the EU in the coming years, particularly starting with the South West infrastructures and connections. This will also include ambitious cooperation plans on renewable energy sources with neighboring countries, including a specific Solar Plan for which an international Conference will be held in Valencia (Spain) on May 2010.